Buy Light Weight Deflectometer – best price! Light Weight Deflectometer for dynamic plate load test using cable or Bluetooth technology: TERRATEST GERMANY is offering two models of the Light Weight Deflectometer (LWD), also known as Light Drop Weight Tester (LDWT), Portable Falling Weight Deflectometer (PFWD) or Dynamic Load Plate Test. Using TERRATEST® LWD is the easy and fast way to check quality of soil compaction in construction sites. One single person needs only two minutes to perform the test, no load vehicle is needed. TERRATEST gauges are fully equipped with GPS system, printer, high-performance rechargeable battery, USB drive, text input function and PC-software. 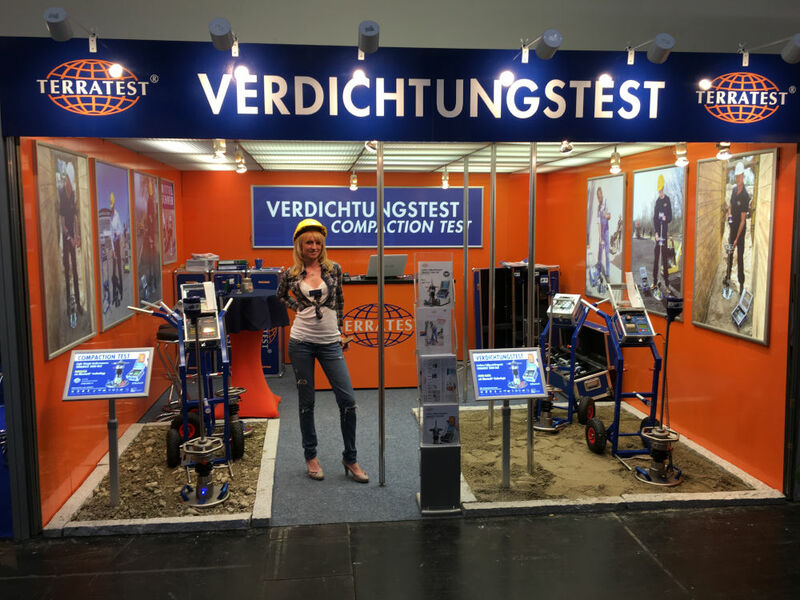 Our soil testing equipment combine the best of both worlds: absolutely high-quality made in Germany and best price guarantee, because you buy directly from the German manufacturer. TERRATEST is the world leader in the development and manufacturing of the LWD. We always adopt new technologies to make our devices more efficient and user friendly. This is why we have developed the “TERRATEST 5000 BLU”, an innovative product with Bluetooth capability, voice navigation and Android-App controllability. 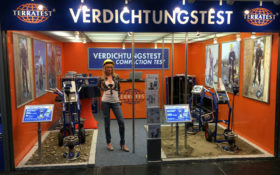 The TERRATEST 5000 BLU was first presented at BAUMA 2013 Munich. 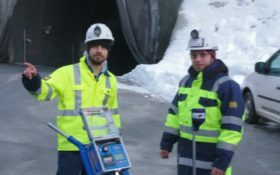 Tests can be carried out without cable connection, the results is then transferred via Bluetooth from the load plate directly to the measurement electronics, a smartphone or tablet. No wires getting in the way! We guarantee an unbeatable price! Click here and get your personal quotation. Light Weight Deflectometer for dynamic plate load test using cable or Bluetooth technology: TERRATEST GERMANY is manufacturing two models of the Light Weight Deflectometer (LWD), also known as Light Drop Weight Tester (LDWT), Portable Falling Weight Deflectometer (PFWD) TERRATEST devices are always fully equipped with GPS system, printer, high-performance rechargeable battery, USB drive, text input function and PC-software. 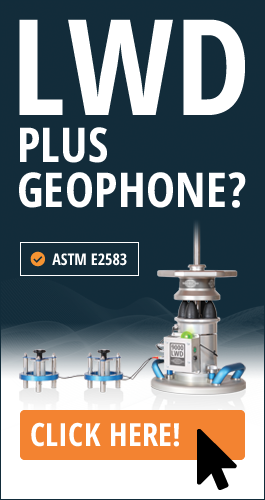 Our Lightweight Deflectometers combine the best of both worlds: absolutely high-quality equipment made in Germany and an unbeatable price, because you order directly at the manufacturer. TERRATEST is world leader in the development and manufacturing of Light Weight Deflectometers, which is why we offer the worlds first ” TERRATEST 5000 BLU “ with Bluetooth and voice navigation! Get here the price of your personal quotation! Click here to receive a personal quotation for your soil testing equipment! TERRATEST 5000 BLU impresses with reliable data transfer, quick pairing and extremely powerful rechargeable battery feed. You can perform up to 2000 tests or 600 printouts with the powerbattery. TERRATEST 5000 BLU is particularly suitable for use on the go. Repairs of the socket of the load plate or of the measurement electronics – the typical “Achilles’ heel” of the device – will no longer be necessary thanks to its wireless operation. NO WIRES, NO PROBLEM! The socket of the load plate has always been the Achilles’ heel of traditional Light Weight Deflectometer with wire connection. Throughout the entire lifespan (15 years) of a Light Weight Deflectometer, the measuring cable has to be plugged into the load plate on the ground every time a test is being conducted. The forces that arise during the measuring process strain the sockets and cables over time. The conditions in a utility trench and road construction are generally an adverse environment for wires and sockets. That’s why experts are choosing our Light Weight Deflectometer TERRATEST 5000 BLU for dynamic load plate tests! 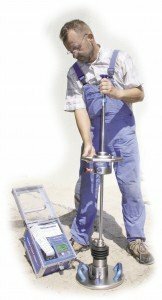 The lightweight deflectometer is the perfect test equipment for construction companies who perform dynamic load plate test for checking the compaction quality of soil. The gauge offers a quick and easy way to perform exact measurements on site. It is used for different kinds of earthwork, civil engineering, road construction, pipeline construction, gardening and landscaping as well as for railway construction. 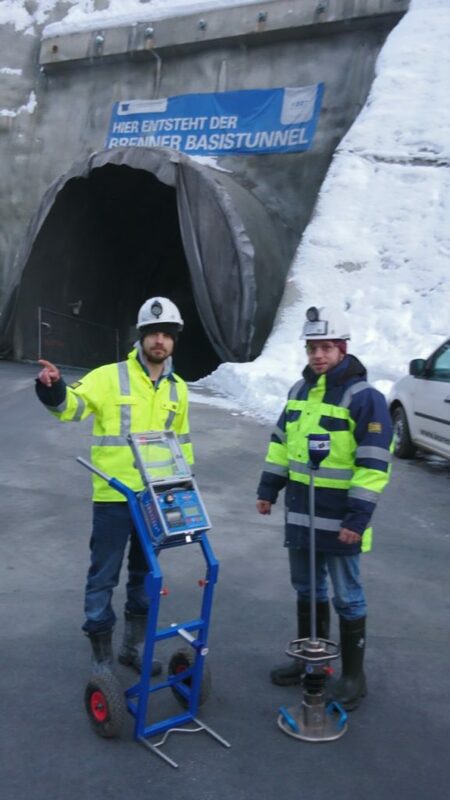 This version of our device is perfect for working in confined spaces. Within just two minutes, even inexperienced users are able to learn how to measure, print and archive soil compaction quality data with this handy device. All TERRATEST® models are equipped with voice navigation and a GPS system. Voice navigation guides the user through the measuring process by way of easily understood announcements. How does the dynamic load plate test work? Put the load plate with the sensor on the ground you want to test and connect it to the measuring computer. Put the drop weight on the load plate. Switch on the measuring computer by pushing the green button. Carry out three initial impulses first, followed by three measuring impulses. Simply follow the instructions of the voice navigation. Experienced and unexperienced users alike are guided through the measuring menu of our Lightweight Deflectometer. After each impulse, the settlement as well as the settlement graph will be displayed in mm on the screen of the measuring computer. After the third measurement impulse, the screen of the measuring computer will display the dynamic strain model, the Evd-value in meganewtons per square meter as well as the path/speed ratio (s/v value) in mm per second. This easy procedure delivers exact data and can be performed in only two minutes. Our equipment is thereby ideal to reduce costs for long waiting periods when relying on testing by specialized laboratories. Results can be printed out or transferred to PC directly on site. This also includes time, date and GPS coordinates. By means of the new TERRATEST® 4000 STREAM model, data can also be streamed directly from the measuring electronics to a smartphone or tablet. With this technology even a cable-based instrument can be updated and send the required data per e-mail to your client. TERRATEST® 2.0 software assists the user by preparing a highly professional presentation of the report – including individual log, statistical analysis and a Google® Maps overlook for all measurements carried out on the corresponding site. Using TERRATEST® 2.0 software makes documentation of tests protocols very easy and allows for a professional presentation. 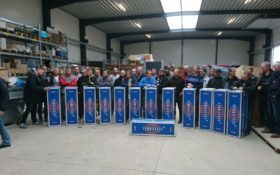 At this time, more than 5000 TERRATEST Light Weight Deflectometers are being used in more than 60 countries all over the world to check compaction quality on construction sites. 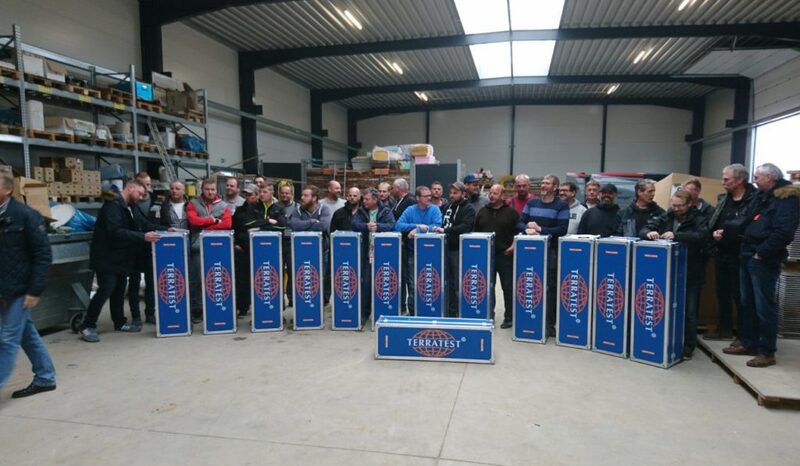 TERRATEST® equipment: This product stands for state of the art test equipment directly from an innovative German developer and manufacturer who guarantees you the best possible price.